For instance, I do a weekly tennis exercise class. I am pretty much there without fail, week after week, year after year. Occasionally, a middle aged man joins us. He is a good tennis player and very, very, very intensely competitive. So intense that some of the tennis ladies refer to him as “Mean Gene” (names have been changed to protect the innocent). He rather brings out the worst in us and by the end of a session we just want to slam that ball at him and perhaps do a little bodily harm. So, imagine my surprise when I was at church last Sunday and glanced up at the pulpit…and there was a man that looked astoundingly like “mean Gene” sitting up there. I opened my bulletin and it listed the guest preacher as Reverend Gene Doe – my “mean Gene” was a minister! I practically fell out of my seat as did Coco who had experienced him. Yikes! I thought he was a mob hit man or a collections agent….What a revelation. Mean Gene actually gave a very enlightening sermon. Frankly, I’m just glad he’s a practicing Christian – who knows what he would be like if he wasn’t. Sometimes with real books, especially cookbooks – I do judge them by their cover. I love my new Prune Cookbook by Gabrielle Hamilton. It’s clothbound in a delicious orchid color with the word “Prune” imprinted on the front in its distinctive funky font . Luckily, the inside is just as divine as the outside. A lot of intriguing new recipes to try. Last Sunday, I made Braised Green Cabbage with Anchovies and Garlic. Of course, I didn’t tell my lovely family the anchovies part until after they were having seconds. 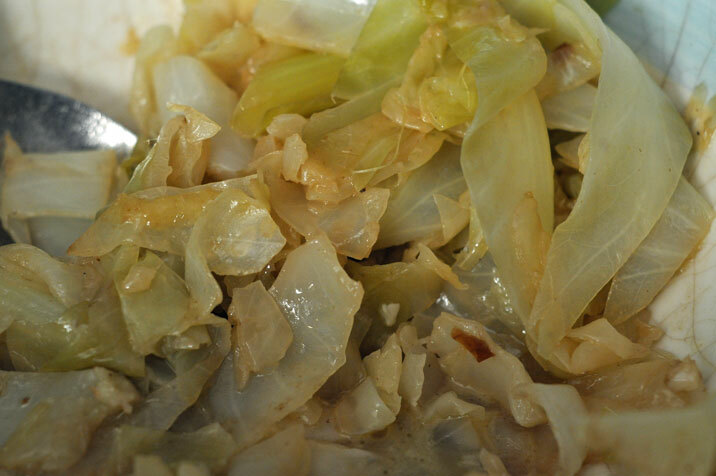 They loved this cabbage dish which was so well seasoned by the anchovies and garlic; the cabbage was creamily sweet. The perfect side dish on a cold autumn day. In a heavy bottomed fry pan, heat the butter over medium low heat. Add the anchovies and garlic, stirring until the garlic softens slightly and the anchovies dissolve a bit. We do not want the anchovies and garlic to brown, just soften, so stir frequently and cook gently and slowly. Rinse the cabbage ribbons in a colander with cold water. Drain without shaking. Water in the cabbage crevices is desired. Put the cabbage in with the anchovies and garlic and stir to coat the cabbage with the butter. Cover with a tight fitting lid, turn down the heat to low. If you don't have a lid use both parchment and foil to create a tight seal. Braise for about an hour, but keep an eye on it as depending on the cabbage it may take less time. When done, cabbage should be a soft watercolor green color and still hold its shape. There should be a rich broth formed from the anchovy, cabbage liquid and garlic. Now stir in a good chunk of cold butter with a wooden spoon and shake the pot a bit as well. Yum.